Okay foodies, I have a question for you. When we were in Denmark a couple of months ago, we visited some friends who served us a pork roast of some kind. It wasn’t really like any kind of pork roast we’d had before, but we couldn’t find out what cut of meat it was. There was a Danish name for it, but that didn’t tell us anything. In Rome, by coincidence, I ended up eating something very similar at a restaurant in Trastavere. But what was it? 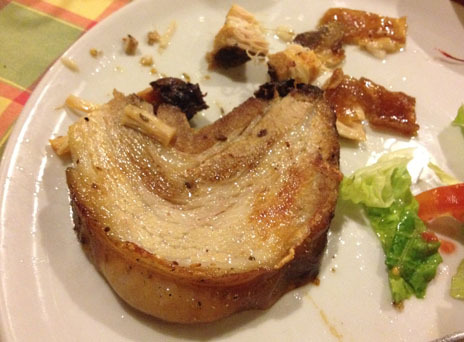 It’s time to crowdsource an answer, so a picture of the Italian pork is below. Question: What is this? Is it something that’s even available in America? If so, what would you ask for from a butcher? Does anyone know?